We love sharing testimonials that our customers from around the globe send in to us! We hope you find them encouraging and valuable as well! I have diabetes and I am on my feet constantly at work. Due to my condition and standing all the time, the skin on my feet and heels would dry and crack so extensively that, at times I would get sores that were gaping and seeping and would never heal. I was constantly in fear of getting an infection that I'm ashamed to say it but I would tape the skin together before going to work in the morning. 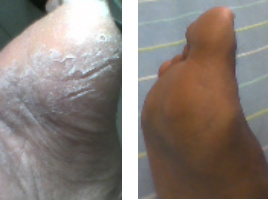 I tried your All Over Face & Body Wash and Double Strength TheraCream you recommended for diabetes foot conditions and I am so thankful with the results. My skin is healthy again and I've thrown away the tape! B.T., Newark, N.J.